She is an accomplished and award-winning cook, but more gastronomically interesting, she is a culinary storyteller. For Mandy Dixon, co-owner and manager of La Baleine Café operating seasonally on the Homer Spit and a year-round instructor at the Cooking School at Tutka Bay Lodge across Kachemak Bay, the end game of preparing a meal isn’t just a matter of eating. It is about creating an educational experience that goes beyond merely pleasing the taste buds. She strives for the meal itself – its ingredients and preparation – to tell a story: specifically an Alaskan story. Nowhere does she achieve this goal as regularly as at the rustic-looking café near the end of the road at the halibut fishing capital of the world. For instance, there’s the café’s ramen bowl featuring homemade noodles garnished with a locally produced duck egg and topped off with pea shoots from a local farmer. And there’s the edible flowers grown in the area gardens, and the dried sea lettuce with its mushroomy-earthen flavor collected from Tutka Bay. Together, these elements represent more than a diversely sourced meal; they represent the people that produced it and the stories of how their lives intersect with cooking and commerce, Mandy says. “Our guests get to learn about the people who live here and how they make their livelihood,” she says. Hers is a passion she came by naturally. Her mother is Kirsten Dixon – the unofficial queen of Alaska’s kitchen whose scrumptious backwoods lodge cooking headlining the family’s two wilderness lodges continually makes national headlines and garners culinary awards. Mandy grew up in the lodge kitchens watching the world’s top cooks prepare meals for the guests and teach students from across the globe the secrets of creating an appetizing and visually appealing meal. Despite her upbringing, Mandy says she didn’t feel too much pressure to follow in her mother’s footsteps. Well, maybe a little bit. But she is glad she did. The mother/daughter duo have co-written cookbooks – most recently in 2013 when Kirsten was undergoing chemotherapy and had little ability to actually taste the food. Yet, it became for Mandy her most memorable cooking experience in that the project gave her mother something else to focus on besides her health struggle. Mandy is unashamedly bullish on Alaska food: She creates a new menu each summer for the café. This year she featured cold-smoked salmon bacon brushed with a “rhubarb lacquer” featuring local honey and shallots for the eggs benedict. “It is a great alternative to pork,” she says. Her favorite Alaskan dessert is much simpler: wild-picked berries and local honeycomb. “That is just delicious all on its own,” she says. Fall desserts at the café feature lots of Alaska carrots and pumpkins. “The soil and the sunlight here in Alaska make carrots and pumpkins taste so sweet,” she says before describing a spiced carrot cake with roasted white chocolate frosting soon to be on the menu. Mandy’s baking also includes a nod to her childhood favorite: campfire s’mores. Her grown-up version features homemade raspberry marshmallows tucked between homemade graham crackers slathered with chocolate ganache. It represents who she is at the core: An Alaska girl trained in fine dining who has found a way to combine the best of both worlds between the “comfort food” at the café and the upscale meals served at the lodge. 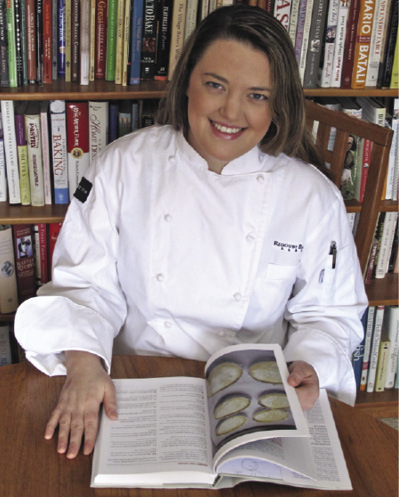 See Chef Mandy Dixon's Dungeness Crab Melts recipe here.